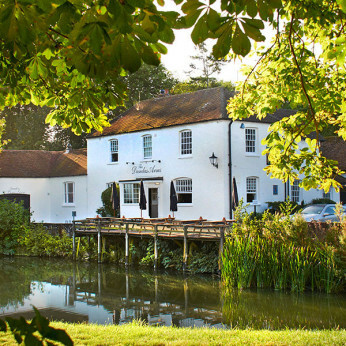 Perched perfectly between the River Kennet and the Kennet and Avon Canal in the charming town of Kintbury, our 18th-century Grade II listed inn is an idyllic place to enjoy a pint by the river. Inside you’ll find distinctive nooks and crannies complete with an antique penny bar, large fireplaces, a handsomely decorated dining room and cosy library. Many of the bedrooms come with their own private terrace overlooking the canal, where you can sit back and enjoy breakfast the next morning or a sundowner in the early evening. Thanks to our riverside location, we are naturally the perfect base for a fly fishing trip, but many people come for the simple joy of strolling along the tow path or taking a boat trip or horse-drawn canal boat ride along the river and canal, which flows past your doorstep. If you hanker for a shot of Victorian history and architecture Highclere Castle is also close by.